The principles of animation have been laid down by Disney Animators Frank Thomas and Ollie Johnston in the “Illusion of life ” in 1981. Some more concepts have been added over the years and one of the most important addition, or clarification, is the concept of “weight shift”. When standing straight, our weight is equally distributed over both legs, so to be able to lift up one leg, we need to transfer that weight in the opposite direction of the leg being lifted up. 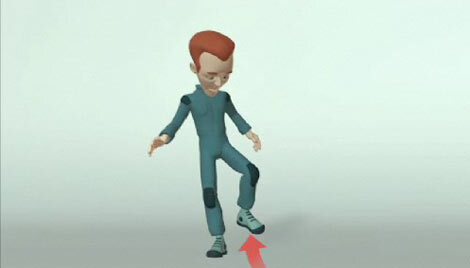 If a character were to lift up his left leg and did so without shifting his weight from the centre to the right, he would immediately fall to the left as 50% of his weight wouldn’t be supported by his left leg anymore. 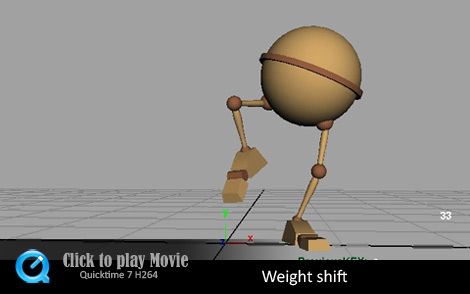 weight shift is a concept you should always keep in mind when animating a character lifting up one of his legs. Successful weight shift is what separate the boys from the men! Kyle Balda has a great weight shift demonstration on the trailer for his Masterclass . by the way, the Ballie step to the side animation is the level of definition I would usually reach in step mode before starting splining the curves. As you can see it is pretty much blocked on 2s but very often I would even adjust the motion on ones to get the correct spacing.